DNSTRACER Video Tutorial on Kali Linux : DNSTRACER is an DNS Information gathering tool which extract unique DNS information which none other DNS tool does. It actually shows how the DNS request is processed. We can query about different types of records like NS, MX, A, AAAA, SOA, NSEC etc using DNSTRACER tool. In this tutorial we will learn how to use DNSTRACER to capture very important information about our target hosts. 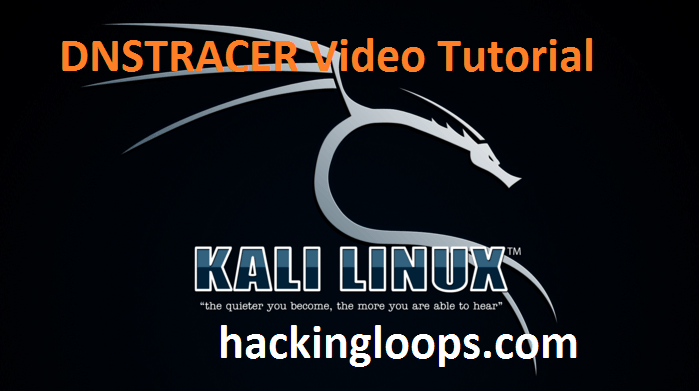 So friends lets see how to use DNS tracer tool on Kali linux. How to open a DNSTRACER tool on Kali Linux ? -o : This option is to display the overview of response we got through dns query. -q <type> : This option is used to specify the query type means which type of DNS record you wish to query about. If you don’t provide the type then by default A record will be processed. We can provide type as soa, ns, mx, aaaa etc..
-s <server> : This option is used to specify the server which will be used to process the initial DNS request. If we don’t specify server then default localhost will be used for dns request processing. We can also specify root server as dns server by giving “.” in place of server address. -v : Show results into more structured format i.e. verbose mode. -4 : This option is used to filter out all IPv6 records from the result. If we don’t specify this option all records i.e. IPv4 and IPv6 records will be shown. That’s it friends. I hope you have enjoyed the DNSTracer video tutorial. Keep Learning !! Keep Connected !! Good information! Indeed you done the hard Work! just a slight mistake in your post, -4 is used to filter out the info with Ipv4 instead of Ipv6! respect your hard work! Thanks for providing feedback. It states that normally we get both IPV4 and IPV6 results into output, -4 command removes the IPV6 records from results, so resulting output contains only IPV4 records. How can i run Kali Linux in my windows 10… Please Help me…. Its similar for all Windows. You can install Kali Linux over Virtual Box or VMware and then can start using dnstracer tool.